Miss Connie (as she is known to some of her friends) always looks as if she's stepped out of an Italian Vogue -but softer - because of all her silvery-blonde gorgeousness. She is, without a doubt, the most stylish creature EVER to come out of Bloemfontein. And yesterday we heard how excited she was that Mick Jagger had visited her hometown, singing God Save The Queen nogal. Reason to celebrate, I would think. 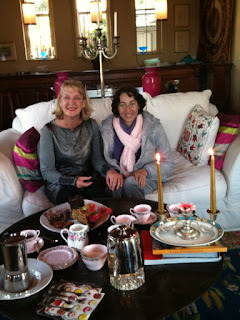 Not that that was the reason Nicci and I were invited to tea; this was no formal, grand, special occasion tea. She had simply invited us to drop in for a cup of tea at 4 o'clock. But what charmed me was the way she had set the table with lovely pink and gold cups, cake forks for the goodies from Melissa's (sticky florentines, dried purple figs, slices of heavy chocolate cake and substantial cheese cake) pretty napkins, and burning candles. She cared enough to make things nice. Connie is that sort of girl.